1 Modernism (industrialization and urbanization) has disconnected and uprooted individuals and society from land, cows, culture, tradition and spirituality. 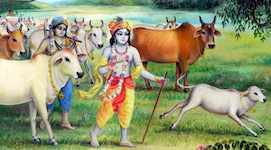 2 As a result, Modernism is destroying three cardinal values of prime importance in the Vedic culture, namely 1) the Gift of Cows, 2) the Gift of Land and 3) the Gift of Knowledge. 1 Modernity, with its over-fixation on materialism, has uprooted individuals and communities from land, cows, culture, and spirituality thus thwarting people’s physical, mental, social and spiritual needs. 2 Unless we reestablish cows, land and knowledge as natural GIFTS OF NATURE not to be exploited, abused or destroyed, we will continue to face severe global social, political, economic and ecological calamities. Our modern urbanized and industrialized society is overburdened with sufferings, calamities, and increased irregularities that have taken global dimensions such as desertification, deforestation, climate change, severe poverty, failing economies, wars, social disruptions, ecological disasters, physical and mental diseases with seemingly no immediate remedy nor any end in sight. These are threatening the very survival of humanity on all levels and in all spheres. The ancient Vedic teachings point to universal basic concepts and principles that can help lead individuals and society to a peaceful, healthy and productive life. Those principles are based on an agrarian lifestyle promoting sustainability, self-sufficiency, localized living and respect and protection of all living entities, especially the cows, all centered on a strong character formation upholding moral, ethical and spiritual values. The proposed study will largely be based on ethnographic research combining theories of research development and action research using both the quantitative and qualitative approach. The population selected will consist of two distinctive groups, the first being 108 villages in different States of India while the second will cover 10 Vedic Eco Villages on different continents all at varying stages of development. The Researcher will formulate a comprehensive questionnaire that will include an Aptitude Test. He will conduct interviews within these two select populations assisted by a research team. Within each of the 108 villages, 10 families from different religious backgrounds will be selected consisting of four members per family for a total population of 4320. Within the 10 Vedic villages on different continents, 10 families will likewise be selected consisting of four members for a total population of 400. The combined total surveyed population will be 4,720. The objective of the research is to gain a deeper insight into three fundamental values upheld in the Vedic culture, namely the importance of cows, land, knowledge and their effect on the social, cultural, economical, health, educational and ecological status in each village. The Researcher will also conduct a one-day seminar introducing Vedic Best Practices and will select a team of villagers who will aim to implement such practices. 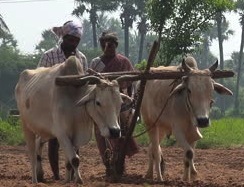 The time factor will be divided as follows: 1) six months to write the Introduction, Review of Literature and Research Methodology, 2) two years to visit 108 villages in India and six months to visit the ten Vedic Eco Villages outside India, and 3) one year to analyze the data and present the findings and conclusion for a total of four years. The Researcher expects that a significant number of individuals and communities will adopt some of the prescribed Vedic Best Practices that should have a positive impact in their lives. These will include improved health, diet, character, cow based economics and farming, training, and education, all centered on self-sufficiency and sustainability. 1 Introducing cow-based natural farming (ahimsa food/ahimsa milk), reviving traditional technologies (ahimsa cloth and other cottage industries), giving special protection to indigenous cows and introducing panchagavya products to help meet basic physical needs. 2 Re-establishing traditional education and training, both non- formal such as apprenticeship and formal such as Gurukulas and Varnasrama Colleges to create Acharyas and Vaidyas who will be qualified to develop traditional Vedic curriculum. This will help meet mental and intellectual needs. 3 Promoting group projects, festivals, counseling services and cultural events to help meet basic social needs. 4 Introducing Yoga, Meditation and sadhana practices, like hearing from scriptures, to help meet basic consciousness/spiritual needs. 5 Reestablishing the dignity and respect Mother Surabhi (cows), to Mother Bhumi (land), and to Mother Sarasvati (knowledge) recognizing them as natural GIFTS OF NATURE that are never meant to be exploited, abused, neglected or destroyed. 1 To help remedy the neglect and sabotage of cows, how can the needs of individuals and the community, under study, be enhanced at the physical, mental, social and spiritual levels? 2 To help remedy the neglect and sabotage of land, how can the needs of individuals and the community, under study, be enhanced at the physical, mental, social and spiritual levels? 3 To help remedy the neglect and sabotage of knowledge, how can the needs of individuals and the community, under study, be enhanced at the physical, mental, social and spiritual levels? 4 What level of satisfaction do individuals experience in meeting their needs at the physical, mental, social and spiritual levels? During the years 2018 to 2020, I will conduct in each community a two-weeks Fieldwork coordinated well in advance with your community. We can gradually introduce or expend upon all the above activities within every rural community under study and beyond. Our objective is to make our rural projects as models of ideal sustainable and self-sufficient Vaisnava communities as so much desired by our ISKCON Founder-Acharya, His Divine Grace A. C. Bhaktivedanta Swami Srila Prabhupada. If your community is interested to be part of this survey, kindly let me know so we can work out the logistics such as appropriate time, schedule, families selected, etc. Researcher: Real Lionel Joseph Gagnon, B.A., M.Ed.